Rising geriatric population globally is driving the demand for medical lifting slings in order to carry out their daily routine. The geriatric population often experiences difficulty in walking or moving and sometimes, certain chronic diseases affect their mobility, which makes them unable to perform various activities. Consequently, their dependency on medical lifting slings help improve the quality of their lives. 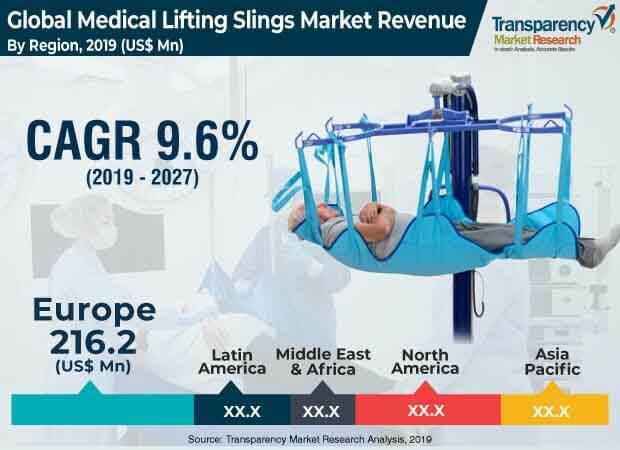 Rise in the geriatric population demands better treatment options, which in turn, is likely to provide opportunities to companies that operate in the global medical lifting slings market. According to the United Nations, the geriatric population, or people above the age of 60, is expected to double by 2050 and triple by 2100. It is projected to rise from 962 million in 2017 to 2.1 billion by 2050 and reach 3.1 billion by 2100. Globally, the geriatric population is rising at a rapid pace, as compared to the population growth rate of the younger age group. Rise in obesity is a key factor driving the medical lifting slings market. As per WHO, in 2016, more than 1.9 billion adults were overweight of which more than 650 million people are obese. Almost 39% of adults above the age of 18 years were overweight and 13% were considered obese. Obesity is prevalent in children and adolescents; however, the disease is preventable if measures are undertaken. Rise in disability, globally, is another factor that drives the demand for assisted patient handling devices globally. As per WHO, 15% of the world population is expected to suffer from some form of disability, with 2% to 4% of the global population experiencing major difficulties in functioning. Presence of key players in the region, rising incidences of chronic diseases, growing geriatric population, awareness of technological advancements, increase in obese population, and strong reimbursement policies are key factors attributable for Europe to be a leading market. . Regulations for medical lifting slings by governments in Europe are favorable toward patients, which in turn is driving the market in the region. Moreover, insurance coverage for patients and huge availability of medical lifting slings are helping patients to easily access slings that are to be used at homecare. Development of medical lifting slings that feature innovative technologies is a boon for the people with disability, which would help improve the quality of their lives. It is expected to offer significant opportunities to several companies investing in this new technology. These medical lifting slings are also beneficial for geriatric population in old age homes, where medical lifting slings would assist the geriatric population to perform various activities. ProMove portable slings are portable, lightweight, and easy to deploy. They are extensively used across age groups, sizes, and weights. The range of ProMove portable slings varies from children to bariatric people with offers a weight bearing capacity up to 630 pounds. These slings, also known as emergency evacuation slings, are preferred to assist mobility in outdoor and indoor spaces among bariatric patients and those with special needs. Key players dominating the global medical lifting slings market are Invacare Corporation, Medical Depot, Inc. dba DeVilbiss Healthcare, Medline Industries, Inc., Bestcare, LLC, DJO Global, Arjo, Prism Medical, Handicare, Vancare, Osprey Sling Company, NAUSICAA MEDICAL, and HoverTech International. Major players are focusing on mergers and acquisitions and are investing in the development of advanced medical lifting slings that are cost-effective for users.